Ever since I was a kid, I’ve loved science. I’m fascinated by the ways in which things work, and how they collaborate with each other to create the world we live in. But, my pursuit of this passion hasn’t been the easiest. I have cerebral palsy (CP), and while that doesn’t interfere with my enthusiasm surrounding scientific endeavours, it does make working in the lab with 1ul tubes and fragile equipment notably more difficult. 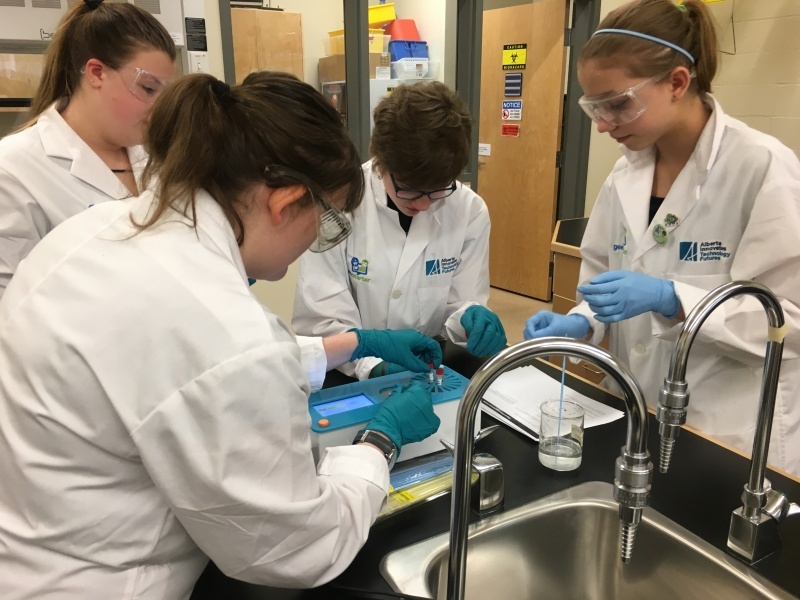 Throughout my time with Team OLS_Canmore_Canada, I have had the opportunity to carry out numerous lab protocols (with varying levels of success), and have identified some areas where accessibility could be improved in order to ensure that everyone can enjoy this subject area. I am second from the right! In order to solve this problem, it is obvious that some level of automation is required. However, the balance between making something easier for a person like me, while still allowing us to fully partake in the SynBio experience is something that can be hard to measure and stay on top of, and rules out methods such as simply allowing someone else to do it for us, or using an electronic/automated machine. The other option is to take advantage of the laws of physics, which as an extra-curricular science team, seemed like the best way to go. Many common products in our world use physical and mechanical forces in order to smoothly transition from one place to another. One common product that we chose to work off of for preliminary prototyping is the technology used to control the closure of cabinet doors in kitchens. I believe that this technology - with proper adaptation - could be used in pipettes in order to make the field more accessible to all people who want to take part in Synthetic Biology. Another issue that I have identified during my time in the lab is how gross-motor tremors impact the accuracy, and thus effectiveness, of pipetting. Much of Synthetic Biology requires not only fine motor agility, but also precision and accuracy of motion. For many people who have physical disabilities, gross motor issues, such as tremors and athetosis (a condition in which abnormal muscle contractions cause involuntary “twitching” movements. ), can impact this vital piece of numerous protocols, and make working with small tubes and vessels a major challenge. This problem is mitigated by increasing the sense of stability while completing protocols. Methods such as sitting down in the lab have proved beneficial in my own experience, however the breadth and diversity of motor issues that people face stretch far beyond those of my own reality, so it is evident that more actions need to be taken. Initially, the best solution to this problem seemed to be an insert into the tube itself, however this could cause problems in terms of application, meaning that a similar level of outside action would be required. Equally, the introduction of a guide system into SynBio materials would inherently make the target (neck of tube, etc.) smaller, thus worsening the situation. The other option in this case is to examine again the functionality of the pipette itself. Through incorporating adaptive technology into the tips of pipettes - be it altering the tips themselves or designing a product to use in addition - the equipment would provide a sort of platform which participants in SynBio can use to stabilise the pipette in correlation to the tube, which would provide the extra stability required. Theoretical prototyping has begun on these projects and I have already gone through multiple iterations of each device. In the time up to the Jamboree and our next iGEM season, I hope to get the chance to begin physical prototyping and begin to test these products in order to make my own lab experience, and those of people who have my passion and physical limitations, easier and more accessible. While this aspect of our Human Practices module is certainly still in its preliminary stages, it is something that I believe is promising and important to address. I am excited to have the opportunity to make SynBio easier and more accessible to all people who wish to partake in it, and hope to break down the physical barriers to this cutting-edge field of science.